The city of Malibu is known for its beaches and beautiful sceneries. All over the city, signs boast about Malibu’s “21 miles of scenic beauty.” It’s home to many Hollywood movie stars and other influential people. But before being a tourist destination and home to celebrities, Malibu was home to Chumash Native Americans. They called the territory as “Humaliwo” which meant “the surf sounds loudly.” The name Malibu is loosely derived from this name. In 1542, Juan Rodriguez Cabrillo reached Malibu Lagoon while searching for fresh water. But it was only until 1770 that the Spanish influence colonized the area. They extended their missions to Malibu in an attempt to convert the Chumash people to Christianity. In 1802, the Rancho Topanga Malibu Sequit was given as a land grant. The ranch reached parts of Malibu. In 1804, the Rancho Topanga Malibu was first given to José Bartolomé Tapia by the Spanish Governor José Joaquín de Arrillaga. After the Mexican-American War, California was surrendered to the United States. However, in the 1848 Treaty of Guadalupe Hidalgo, it stated that the land grants would still be honored even after the cession. In 1848, Tapia’s widow sold the ranch to Leon Victor Prudhomme, her grandson-in-law. Prudhomme filed a claim for the ranch, but his claim was rejected. Instead, he sold the land to Matthew Keller in 1857. After Keller’s death, it was sold to Fredrick Hastings Rindge in 1891. Fredrick Rindge protected the land from both individual and governmental influences for years. Rindge even hired guards to evict all trespassers. He won a court case to keep the Southern Pacific railroad line from building tracks within his property, leading him to build his own. Even roads rarely entered their lands until 1929. But Rindge died in 1905, leaving his wife, May Rindge, to continue protecting their lands. In 1926, May Rindge founded the Malibu Potteries tile factory to raise funds in order to avoid selling their property. However, a fire destroyed the factory in 1931. She attempted to reopen the factory but was held back by the Great Depression. Malibu was opened for development in 1926. The state of California built the Pacific Coast Highway after winning a case against May Rindge. At this point, May Rindge was forced to begin selling parts of her property. The Pacific Coast Highway served as the primary route through Malibu even today. In 1929, the Malibu Colony became the first residential area in Malibu. Even with the developments in her land, May Rindge only opened the lands for select celebrities to build their vacation homes. She allowed permanent residence to celebrities during the 1930s. In 1991, most of the ranch was already incorporated as a city for local officials to control the area. Since May Rindge’s decision to open the lands to celebrities, the Malibu Colony today is a gated community with multimillion-dollar homes. The Colony provides residents magnificent views of the Pacific Ocean and beaches along its shores. Today, it continues to be homes to celebrities and influential people. Want to have something to remember your Malibu trip? 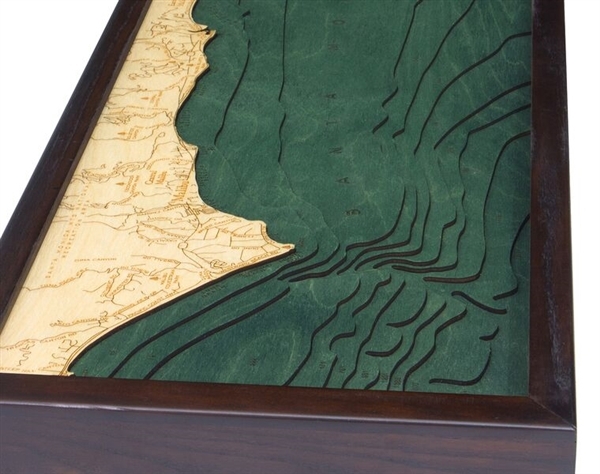 Carved Lake Art has an amazing collection of custom made wood art like this 3D topographical map of Malibu exquisitely made from Baltic birch wood. If you want to see more check out here.